These are my primary ethnicity estimates, which are correct as far as I know: my mother is Japanese, my dad is Irish-American. Three of my dad's grandparents were born in Ireland and immigrated to America; one of his grandmothers was born in New Jersey to Irish immigrant parents. I'd figured with Irish history being what it was that my Irish side was likely quite mixed in a northern European kinda way. 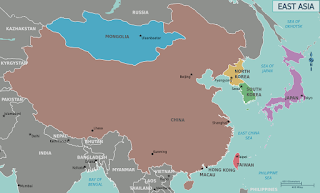 But my God, seriously--50% East Asian? That's still all Ancestry can give me in terms of that side of my family, by the way. 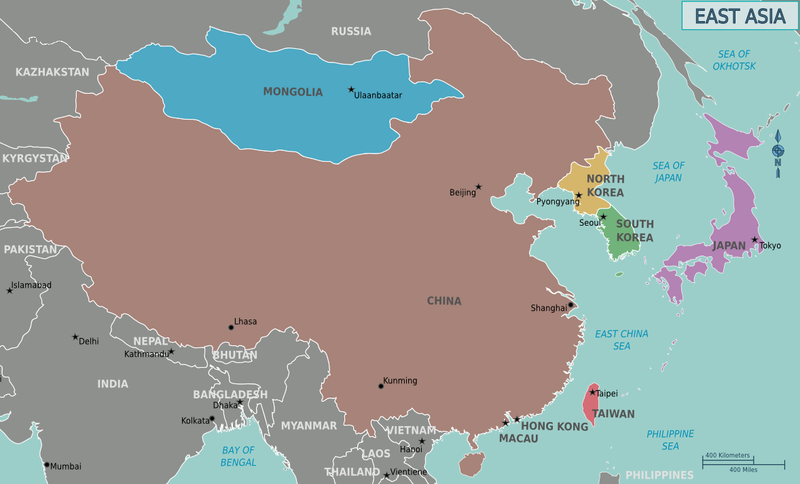 Do you know how big East Asia is?! 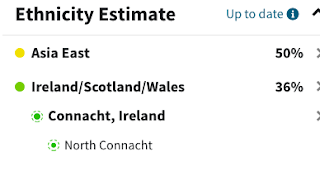 The Connacht, Ireland/North Connacht subheadings--which, yes, is the Irish region my family comes from--was added a couple of years after I'd turned in my original DNA test. 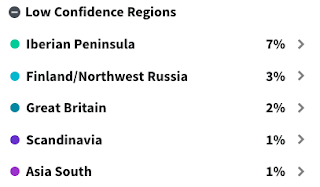 It's a very specific region to highlight from DNA, I think, when they can't even differentiate between various ethnicities on the world's largest continent. So, there are parts of this that make sense and parts I have questions about. The Iberian peninsula--Spain and Portgual-- kind of makes sense; there was some Spanish migration to Ireland, but equally, the Basque region is Celtic, which Ireland also is so...am I part Spanish or just part Celtic? How was that 7% determined? Finland? How....? Britain and Scandinavia make sense in a colonization and Vikings-in-Ireland kind of way. I don't even know about that Asia South thing. I guess it's on my white side, but how, I have no idea. I'm not totally sure how recently or distantly Ancestry tests your DNA for--is it eight generations? Ten generations? What branches of the family tree are these trace regions showing up in? I have no idea. What the test did do was connect me on Ancestry to a bunch of people ranging from second cousins (and in fact, I've been able to find out through my family tree research how I'm related to second and third cousins) all the way out to 4th-6th cousins, where I have no idea who the common ancestor is because Irish Catholic records don't go that far back. This Ancestry test remained a point of bemusement for the whole family for several years. It's not like being supposedly 1% of something has affected the way I identify myself, after all. Since I've done the Ancestry test, a number of other DNA testing companies have sprung up. 23andme is the other big company offering DNA ancestry tests. Having already done one--and having become more aware of the way these companies make money off your DNA and other issues--I didn't want to take another one, especially if the company wasn't offering a decent reference population for Asians. But my mom's friend's daughter--also half Japanese, half European--took a 23andme test and got interesting (and accurately Asian) results. Then I started watching YouTube videos of people taking the 23andme test and not only learning their ethnic origins, but also being able to trace their haplogroups and getting a timeline of when these various ethnicities came into their family gene pool, so to speak. I was like, "That'd be cool to know my maternal haplogroup. And ooh, timeline! I might find out where that Finnish DNA freaking came from! Or, you know, anything about the Asian side." 23andme was having a sale, so I bought one, spit in a tube, and sent it off. 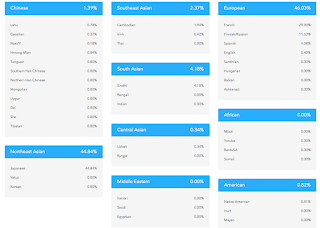 And while I was waiting for the 23andme test to get to me, I found out about a Chinese site called WeGene where you can upload your info from Ancestry or 23andme and if you're Asian, WeGene can help break down those admixture tests by various Chinese and other Asian ethnic and regional groups, which is super cool. I guess out of that 50% East Asian per Ancestry, I'm 44% Japanese! And I'm a tiny bit Chinese (not surprising), a tiny bit Cambodian (ooh, is that why my great-grandmother was supposedly tanned with wavy hair? ), a wee bit Uzbek, and Sindhi, an ethnic group native to present day Pakistan. I mean, who knows if this is remotely true or not--except the 44% Japanese, of course, that's totes correct--but it's a lot more interesting than "50% East Asian." But because it's based on my Ancestry results, I'm still not sure of a timeline or how long ago some of this DNA was--and if Irish is coming up as French on WeGene, who knows what else might be something different from the breakdown they're giving me? Currently waiting on my 23andme results. I'll definitely post when I get those! 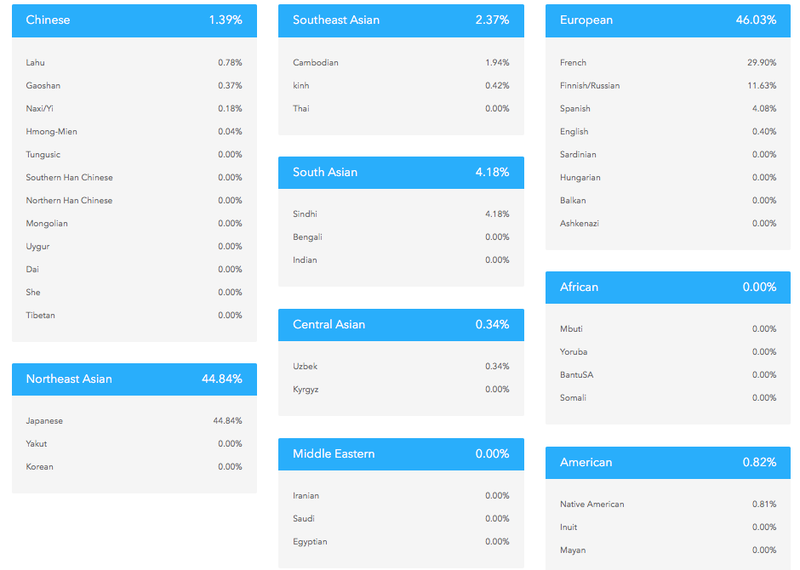 The WeGene results are very interesting! I have less than 0% East Asian, so I don't even count it. I've taken a few tests, and they were definitely crazy-making, but they were also interesting. It’s like, while they all agree on the main two regions, which matches the legwork my mom has done, and while the percentages for the two main regions are all also pretty close, maybe just a percentage or two off, none of them can agree on the breakdown for the rest of it. Like how much is Middle Eastern and Native American and whether there are trace amounts of East Asian or not. Maybe it has to do with how they break things down, but to save my sanity, I just averaged everything together and go with that. LOL! Ancestry.com offered a good breakdown of specific African countries, and 23andMe offered a nice map of all regions specific to my DNA, though it didn't break anything down in specifics. I also did National Geographic when it was on sale. I’m actually still trying to figure that out, but it also did regions, a little more specific than 23andMe, and had a list of famous geniuses in my ancestral line, which was fun. I'm really looking forward to the 23andme results! I can WeGene those as well and I guess I'll see what that looks like. Interesting! I honestly hadn't heard much about those tests. I can follow my mother's family tree back for over 200 years. Very German. My father, however, knows he's a mixing pot extreme. It'd be interesting to see how extreme. Oh, yeah? They seem to advertise around here a lot. 200 years! Wow, cool! You must have some characters in that tree!